Did the rainy season end at last ^^ The public notary office was requested by slight height from Harley’s number acquisition and remuneration usual also in miscellaneous business in addition to this today. it is in order that it may not be unavoidable…. Various contractors inquire frequently that the land around the Kagoshima office should also sell two places simultaneously. although it is these times, a price is likely to go up still more from now on. it is the method ? of comrades (smile). It went to the Kagoshima office by new article construction signboard of the operating + speciality after a long time today. A feeling of use had come also out of my toys very much…. The hips rise also of the go-cart was carried out like the muscle car on the horse for cars. a go-cart stable in it being unexpected, although it is heavy. the construction signboard was transferred near the swing. 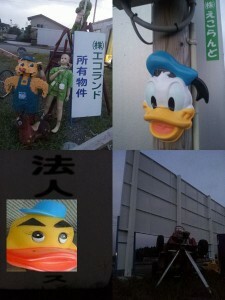 The mask of the duck for summer festivals is also the completion of installation. It is work till Collot assistant and midnight tonight.